Happy Monday! Here’s my absolute favorite outfit I wore in LA. I’m so obsessed with these paper-bag trousers that are not only so cute but SO comfortable. I got this pair from Forever 21 before I left for LA and I can’t wait to keep wearing them throughout the summer. Here are a few pictures from the Paul Smith wall as well as the plant jungle we happened to stumble upon (if you saw my last post). I also have been drooling over a really expensive Chloe bag and so I went on amazon and found a $30 dollar knock off. I’ll link it above! Happy Tuesday! It’s been a little while since I’ve written a blog post, partially because I’ve been out of town, and partially because I haven’t had as much time. But I’m back with a post all about my recent trip to Los Angeles! Una and I decided that instead of hopping on a plane, we would venture on a road trip this time to save some money and to explore this beautiful state we are already living in. After the seemingly short six hour car ride, we settled into the cutest Airbnb located right next to Griffith Park. I was so excited to finally explore the city! I grew up visiting LA a handful of times, but to only see my relatives. I had never been to actually see LA for what it was. So, the first day we were there, we did all of the touristy things like go to different hot spots (i.e. Paul Smith, angel wings, LACMA…) and take photos. However, one of my favorite things about this day was finding a bunch secluded spots that we just happen to stumble upon. That afternoon we were driving to Shake Shack to grab a quick bite, and drove past this plant jungle. After eating, instead of going straight to the walls, we found a parking spot and wandered around the cactus filled garden for a little while. This seemingly little adventure, added immensely to the excitement of our day. After a full day of wandering to and from different popular and hidden spots, we finally ended up at LACMA. We didn't actually go inside because we both aren't very fond of museums, but we of course snapped some photos and walked around the area a bit which was fun! The last thing I want to say about our trip is actually about the people. I was so surprised to notice how inviting and accepting the people were! Well maybe not when we were driving per say (LA TRAFFIC :/ ), but just walking down the street or sitting at a coffee shop I noticed a slight difference. I loved seeing how people weren't afraid to be themselves whether through how they talked, dressed, or acted. Una and I were sitting at a coffee shop when two guys asked us to take a photo of them. Of course, we agreed and then after they basically took our phones from us and started taking pictures of us too. I felt so much more comfortable (rather than embarrassed) to document certain aspects of our day just by this one simple act these two guys had displayed to us. One of my favorite things to do, which you all probably already know, is take pictures not only of myself, but of my surroundings as well. More times than not in the Bay, I am so embarrassed when I snap a video or photo because I think people are judging or look down upon me because of this. One thing I am determined to take away from this trip is to basically to stop giving a f*ck and just do what I want. I know this sounds so clique and may come off as a bit conceited, but I'm pretty shy and get embarrassed easily which causes me from doing something that I want. So, I'm going to try to not give into this and do what I want. Haha! I’ve been waiting so long to wear this dress! I got it at the end of last summer because it was on sale and it’s been sitting in my closet gathering dust ever since this trip. Now I’ve just got to wait until the sun decides to make it’s debut back up here in the Bay. Sorry I can't link the exact dress because it's from last season, but I found a few similar ones that I also love! It's such a fun dress to wear with a pair of sneakers to dress it down a little bit. I seriously cannot wait to wear it more! I fell in love with this city. I told Nils that the first time we visited it was my least favorite place, because we didn’t do much or experience the city at all. However, this time was a whole different experience. One of the most important decisions we made, was our location. We stayed at Alexanderplatz which was the U-Bahn (train) station right under the TV tower. This made getting around so much easier because many of the places and things were either walking distance or a few U-Bahn stops away. Another thing that was a complete game changer were staying in hostels. We were able to meet some amazing people from all over the world. This made pub crawls, going out, and just hostel life in general much more fun. We even met someone from San Francisco which was so cool! Lastly, we did way more things than the first time. First of all we were there for nine whole days which gave us plenty of time to both do things and chill out. We went on walking tours, spy museums, Olympic stadium, Brandenburg Gate, Jewish Memorial, the East Side Gallery, AND we even found a few climbing gyms. Luckily, we were there for Christmas which means there were loads and loads of christmas markets. We went to one almost everyday and got curry wurst, gluhwein, and a pretzel. Staying in the heart made it so much easier to experience the people and the culture. One last thing that I loved about Germany was the language. If you have been visiting my blog regularly, you know I am learning German from Nils which is actually going surprisingly well! I was actually able to order food at restaurants and have a few (very simple) conversations with people. Growing up, I took a few classes in different languages, but never really stuck with one. Focusing in on one language and trying to get really good at is is really rewarding, especially after visiting the country and having conversations with native people! 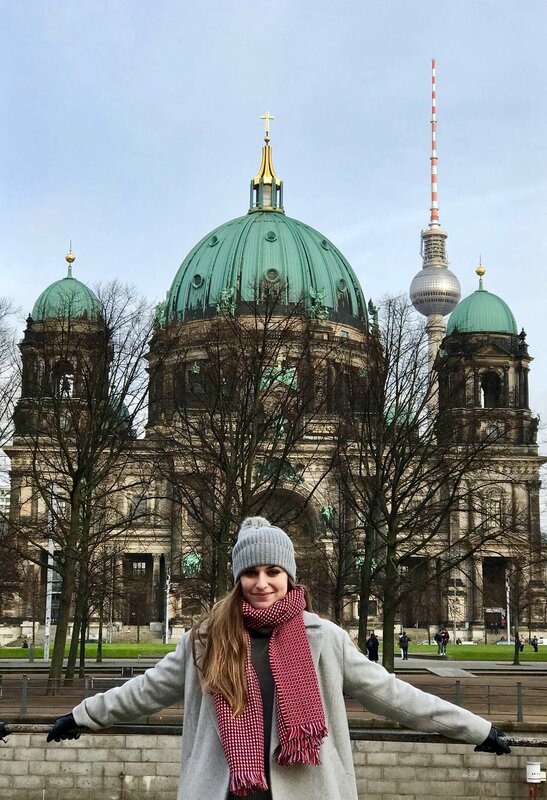 Needless to say, I had the best time in Berlin and am so glad that it went from being one of my least favorite cities, to one of my absolute favorites. I can’t wait to see you again Berlin! 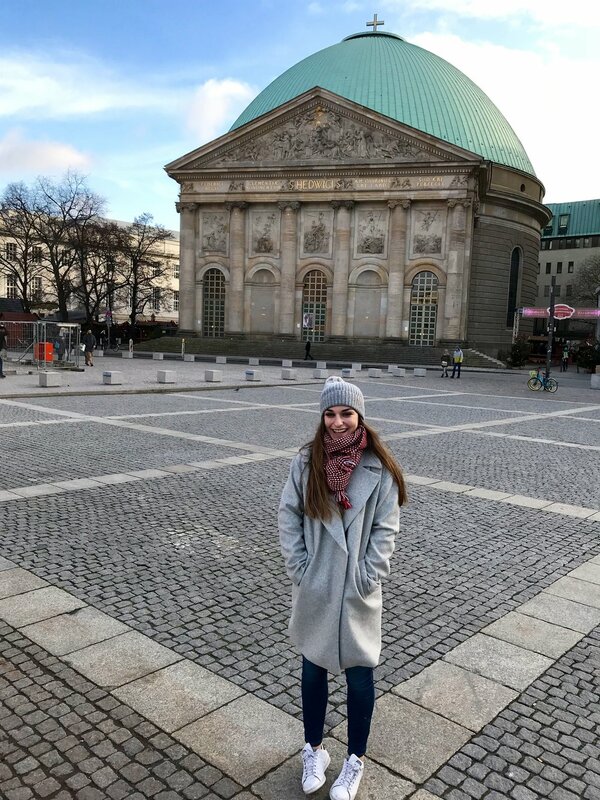 This was one of my favorite outfits to wear in Europe, however, it was a little chilly because the coat wasn't as warm as I hoped it would have been. I should have brought a vest to wear under it. BUT, with that said, I still wore it a bunch because it was so cute! I especially loved pairing it with either this red scarf or a red sweater (see here). We also never left the hostels without a beanie. I always chose this grey one with the grey coat. I love when things match, but that's just my style. PS: I still have so many photos from Berlin. These are just a few from this outfit I was wearing. Stay tuned for another post!